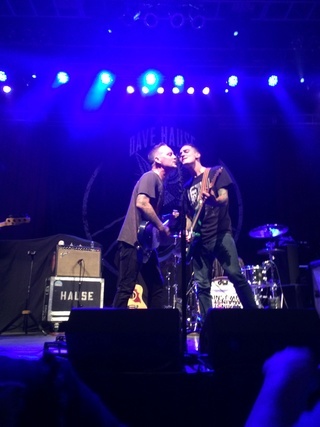 The first Dave Hause show this year yesterday in Reading, PA was full band. The tour started in Sayreville, NJ. Dave seemed to be quite reserved or maybe a bit shy because it wasn´t his audience? I haven´t seen him play this way before, very low interaction with the crowd. The next show in Huntington one day later was similar. The sets were 30 min. long, Tim on keys and guitar, no new songs so far. Fortunately the headline show in Stanhope changed the mood. The show was full band with Brendan Hill on drums and Spider (Michael Cottermann) on bass and it was killer! Both, band and audience, had fun and a great time. They played two new songs: Divine Lorraine and Dirty Fucker. Dave asked the audience not to put the new songs on the internet, and actually there´s not a single clip of them on Instagram or YouTube (except Christina's merch clip). No idea why it says C’Mon Son on the setlist. Maybe because Dave und Tim’s Dad was in the audience. Night one in New York City was much better than Sayreville or Huntington. Dave broke a string on his acoustic guitar during C’Mon Kid (or was it Prague? ), so he had to play the next song on his electric guitar. On night two in New York City they smashed it! 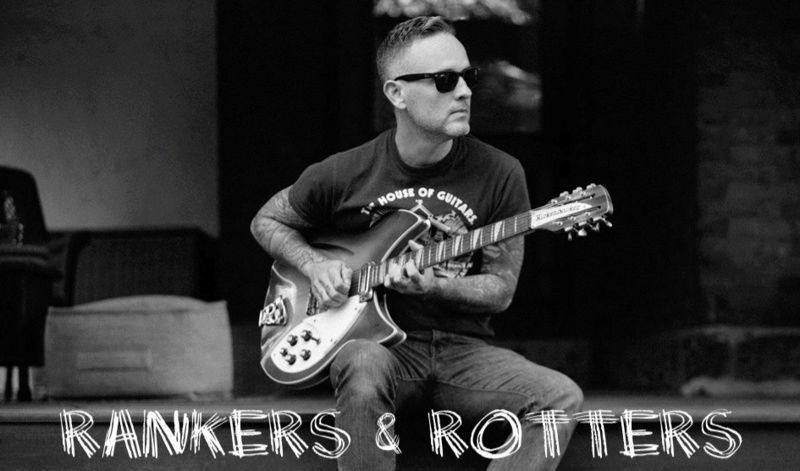 The drums were unpacked during Time Will Tell and then Jay Bentley of Bad Religion und Atom Willard of Against Me! 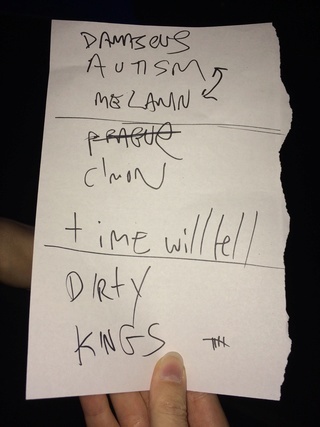 joined Dave and Tim on stage for Dirty Fucker und We Could Be Kings! Philly was (as expected) the best show. It´s always amazing to see your favorite artist in his hometown, where he is fired up to play for his people. Even Eric Bazilian of The Hooters was in the audience. Dirty Fucker and We Could Be Kings were full band again. Silver Spring was my last show on this run, during which Tim played much more guitar than last time I saw him on stage, even some pretty cool solos. Last two songs full band again, Dirty Fucker was dedicated to Donald Trump. P.S. 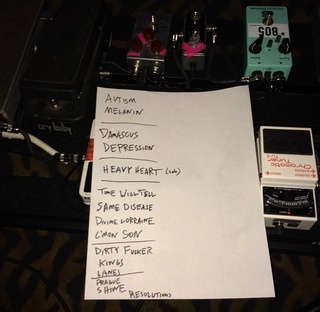 : I try to post a setlist photo from each show I´ve been to. 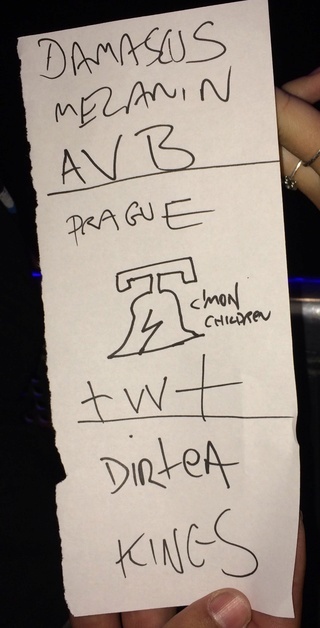 But I don´t catch and keep all these handwritten beauties, I just try to get one of them each tour. So if you catch a setlist and a few seconds later someone taps on your shoulder, asking for a photo, it´s most likely me. Thanks for compiling all of this Susan! After hearing Dirty Fucker live full band I'm sooo excited for DHLP3! Thank you so much for Susan! Fullerton 02/11/16 Divine Lorraine (Clip) NEW SONG!